MyTop 3 Series is back, this time with Lipsticks. Choosing only 3 lipsticks was really hard. 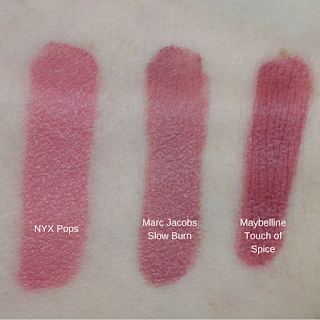 I really emphasized the formula but these are also my favourite shades from each specific lipstick line. You'll notice I clearly lean towards more rosy colours. I always get compliments whenever I wear this lipstick. I really believe these are the best matte lipsticks at the drugstore and are good enough to rival any high-end matte lipstick. They are super comfortable, opaque and creamy. However, due to their creaminess they don't last as long as other matte lipsticks. This is my favourite everyday lipstick. I'd describe it as halfway between a creamy lipstick and a lip balm. It feels really nourishing on the lips but it takes a few swipes to build up the colour. It's so comfortable, it doesn't feel like you're wearing anything on your lips. It's also drugstore so you know the price tag is reasonable. Plus they smell so yummy! Last but certainly not least. I know I've raved about the formula of these a lot recently but it's really that good. It is super opaque with just one swipe, it's super long lasting and very comfortable. I don't have a bad thing to say about it except for the steep price tag, however I think it's worth the money. Monthly Favourites Time! It's been a while since I did a monthly favourites post. November was a very strange month for me as I didn't have school (long story- not by choice), so I didn't wear a lot of makeup. However the Sephora VIB sale allowed me to get some new products. I needed a new foundation and the lovely woman at Sephora helped me pick this one out (finding a foundation that comes in my snowy-white shade is not easy so extra points to UD). 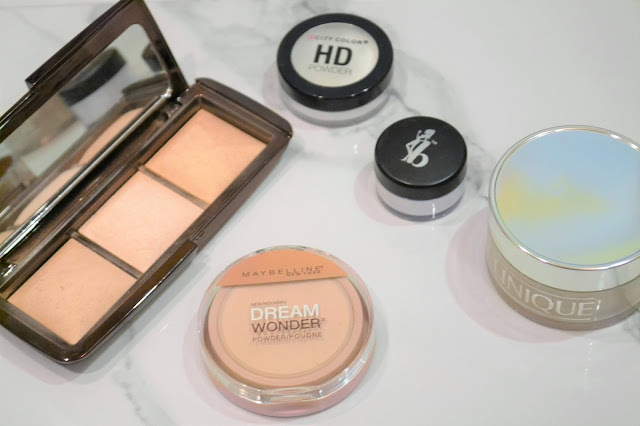 I love how it doesn't feel like you're wearing foundation but it's still buildable enough to give you good coverage. It also doesn't stick to my dry patches and allows my skin to still look natural which is literally all I'm looking for in a foundation. The downside is it smells, quite literally, like paint. This is a nail polish I got in my Ipsy bag. It's super opaque with only one coat and surprisingly long lasting. I've been wearing it a bunch this month. It looks especially festive with a glittery gold top coat. This a a perfect everyday lipstick for me. The shade looks really natural and the formula is super comfortable and long lasting. 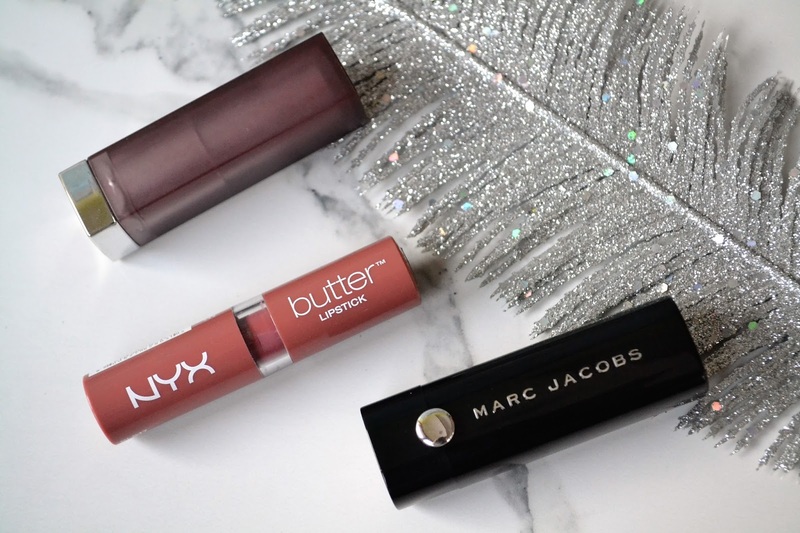 I know I've talked a lot about Marc Jacobs lipsticks on my blog but it's got to be one of my favourite formulas. This is another product I received in an Ipsy bag. I really love this concealer pencil for covering up spots. It's thick and has high coverage which makes it perfect for concealing small problem areas. 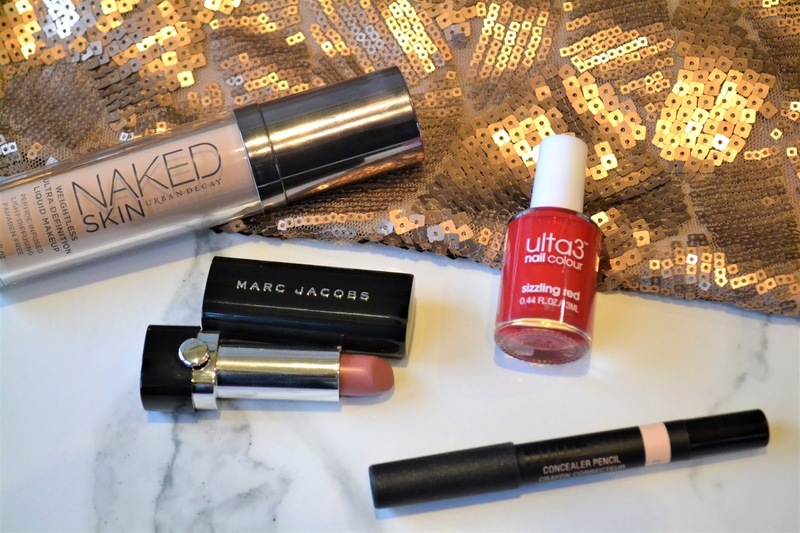 What were your November Favourites? Make sure you're also following me on Instagram and Twitter where I have lots of holiday themed posts and mini reviews! 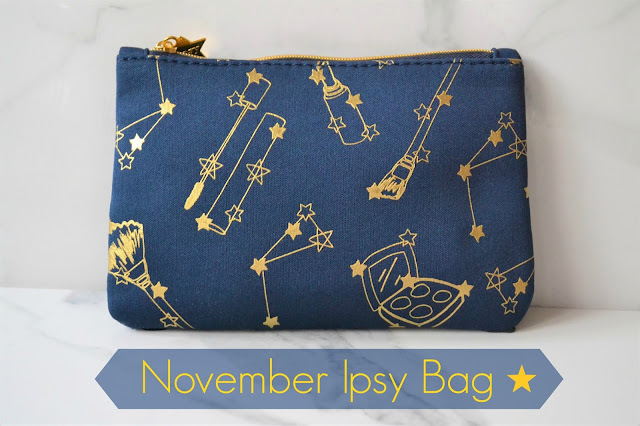 It's another month and another Ipsy bag. I was actually happy with everything I got in this month's bag which is fairly rare. The bag itself is also cute! It's a dark navy and gold. I really like the brushes from this brand so I was excited to see this in my bag. This is an extremely soft brush and it applies just a little bit of product at a time so I've been liking it to apply highlighter. This brush is travel size and retails for $16. I haven't been a fan of the other Skone products I've recieved in bags before but this brow pencil pleasantly surprised me. The shade is perfect with my dark brown hair and it comes with a brush on the other end which is convenient. I find the triangle shaped tip takes a little getting used to, but overall it's a good long lasting brow pencil. This is full size and retails for $18. I've never heard of this brand before and I'm usually not a fan of cream products but this highlighter is pretty good. 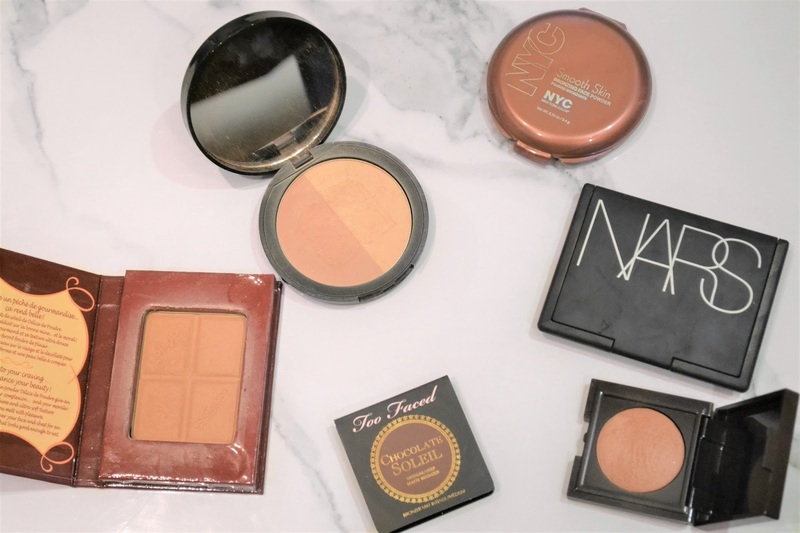 On my pale skin, it works a little bit better as a blush topper as the peach is a little dark for my cheekbones. It gives a nice glow and the texture isn't sticky. This is a sample size but full size, it retails for $18. I always love getting high end brands in my Ipsy bags. I've actually used this mascara before and while I love the brush and how it makes my lashes look, I find it smudges on me so I'll probably give this one away. This travel size which retails for an astonishing $15. Another higher end product. I have very fine hair so hair oils are tricky for me but this one didn't make my hair too oily. It also didn't make too much of a difference so I'll need to use it a bit more to determine how I feel about it. This is a sample size but the full size retails for $16. This is probably the best value bag I've gotten. I've calculated it to have over $55 worth of product! My collection has grown and changed since the last time I showed my makeup collection so I thought it was time I did an update. Just in case it isn't obvious to anyone, I am NOT trying to brag about my makeup. I love to be nosy and look at other people's makeup collections so I thought I would share mine for all you other nosy people out there. 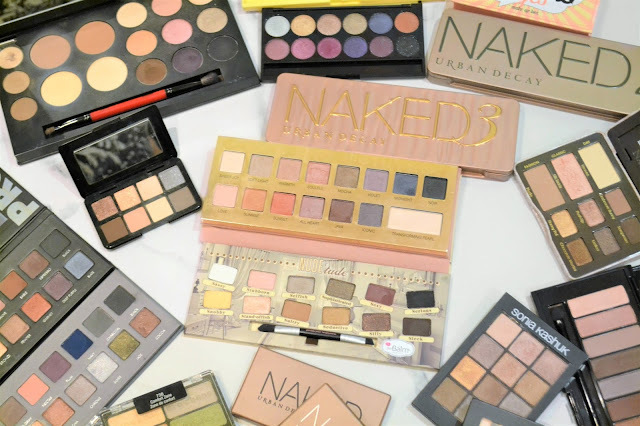 I know I have a lot of makeup, I am lucky and have received much of it as gifts from family and friends. I also save up my money and mostly only spend it on makeup. 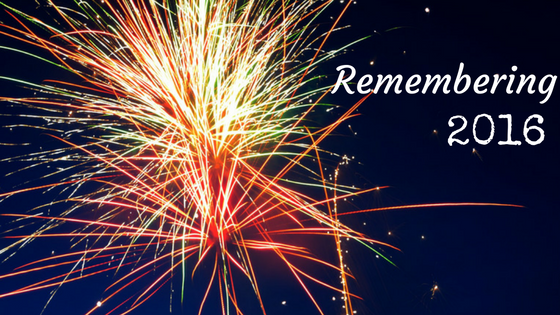 I have attached links for the products I have reviewed in the past. The last time I showed my makeup storage was over a year ago and I've made quite a few changes to how I organize my makeup since then. If you want to take a trip down memory lane you can see how my makeup storage used to look here. The point of this post is to share how I organize my makeup and maybe give some tips on how to store your makeup. I also made the brands/companies clickable so it's easier for you to shop the storage options for yourself. 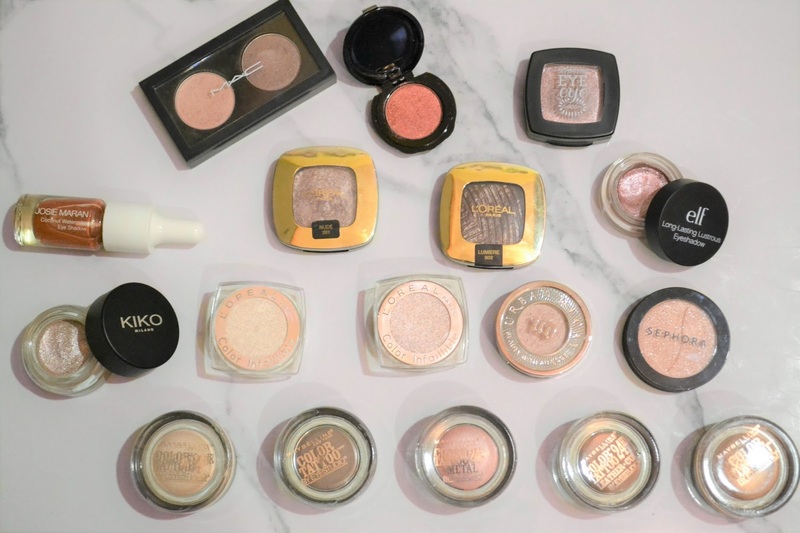 Come back next week for my updated makeup collection posts. I'll start with my vanity which I got from Bed, Bath and Beyond (I think my exact model is discontinued but I found a similar one). It has a tri-fold mirror and a fake marble counter top as well as a drawer and a cupboard for storage. I added the vanity lights on top. I used a file organizer from Staples to display my eyeshadow palettes. Not only is this a good way to store them, I also am more inclined to use them because they're all in my line of sight. 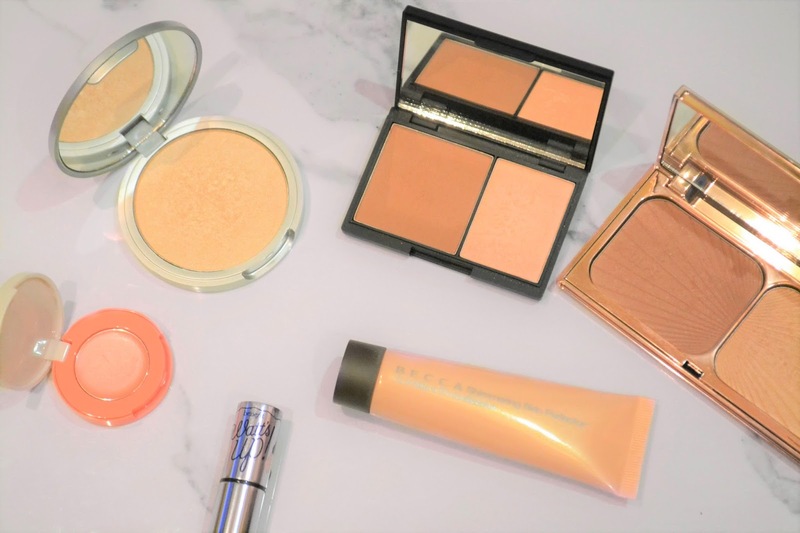 I got the hexagon shaped rose gold dish from Urban Outfitters and I use it to store my everyday skincare (and my little rose gold bunny). I got the 3 drawer organizer from Amazon and I use it to store my highlighters and cheek palettes (top), blushes (middle), bronzer and cream blush (bottom). I bought the vase, stones and flower from Michael's. My eyeliners are held in a purple flower pot that I filled with clear beads. I store (most) my lipsticks in this acrylic holder from the dollar store but you can also find them on Amazon. 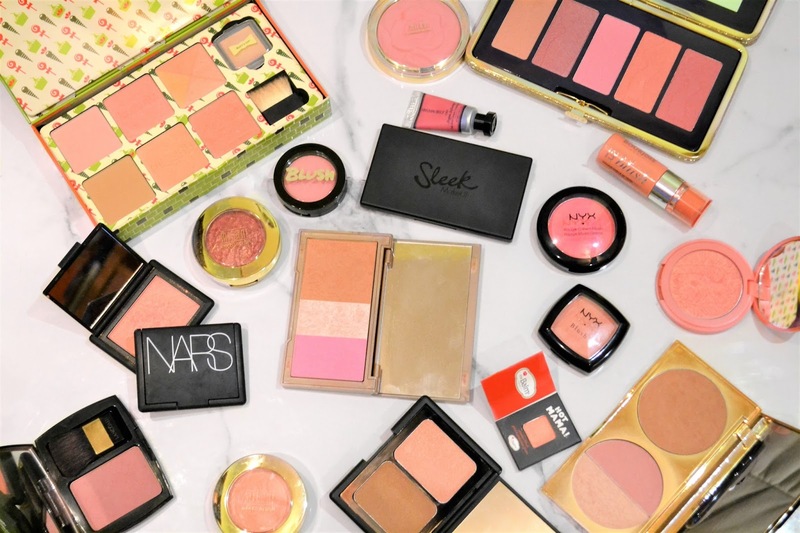 Behind that I keep my larger blush palettes. My eyeshadow sticks and lip pencils are stored in this rose gold candle holder from Anthropologie. I converted this flower pot I found in a hardware store into a brush holder. I filled each side with clear beads so the brushes will stand up. I don't have a link for this one but it's really easy to convert any small flower pot. I especially like this one because it has a distressed vintage look and a way to separate my face and eye brushes. I got my two-sided vanity mirror from Hudson's Bay. I got my everyday makeup bag from Milly Green. I painted an Ikea container (similar but different lid) with Rose Gold paint to keep my cotton pads and Q-tips. In my vanity drawer I keep my most used eyeshadow palettes (itCosmetics, Too Faced, Naked Basics 1&2), my least used/small eyeshadow palettes and my contacts on the left. I keep my single shadows in this organizer from Bed, Bath and Beyond. In my side cupboard I use this mesh drawer from Bed, Bath and Beyond to keep my foundations and various beauty tools in the first section, less used skincare in the second section, and my samples and less used makeup in the back. On the bottom shelf of the cupboard I keep my lip products in this 4 drawer organizer from Bed, Bath and Beyond. I organize them by colour from Left to Right- Purples/Plums, Reds/Oranges, Pinks and finally Nudes. I keep lips scrubs and lip balms on top. 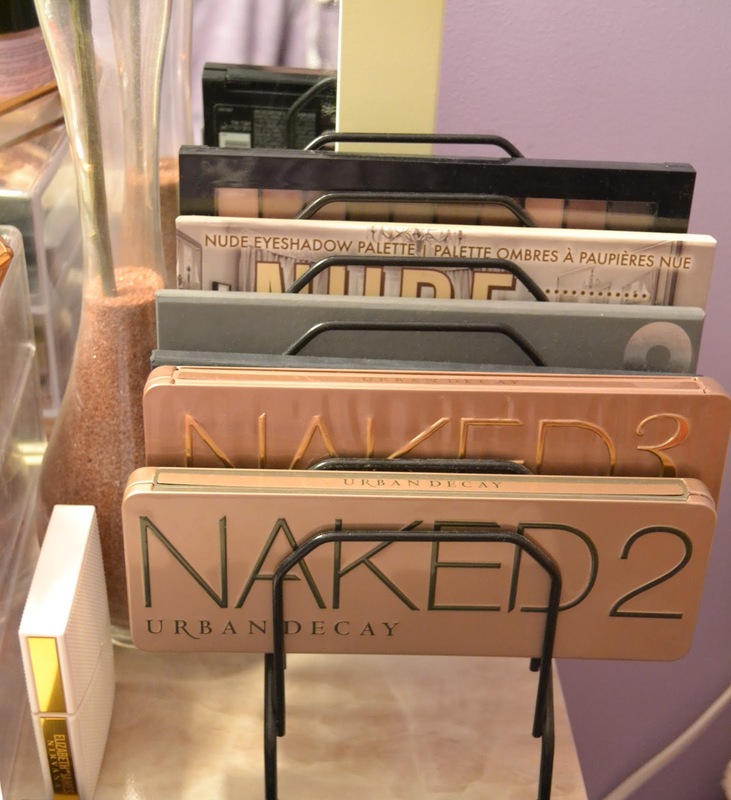 I hope you enjoyed this look at how I organize and store my makeup. Do you have any good organization or storage tips? I wanted to do a really warm autumn eyeshadow look that incorporates lots of reds and oranges. This is what I came up with. This look can be done with any similar shadows. I started with Sunset and Sunrise from the itCosmetics Naturally Pretty Palette. I took Sunrise, the matte brownish orange shade, and buffed that messily in my crease, almost to the brow bone. I then took Sunrise, the matte reddish shade, and took a more precise crease brush and applied that directly into the crease. All over the lid I used the shade Spice Market, a reddish cranberry from Nomad. I used Mac Fix+ to make the shadow more pigmented and bright. Using my finger I then pressed a gold shadow (I used one from Sonia Kashuk) right in the middle of the lid. I mixed Spice Market and the gold shadow and smudged that along my lower lashline. I finished up the look with Jordana Liquid Liner and Tarte Lights Camera Lashes Mascara. What's your favourite makeup look for autumn?